Ask The Bellwether: What's it like to teach? What's it like to teach? I've been around for a while now — I think you all know that, I know that I know that, for sure. I've often thought about writing about teaching, what it's like, how I prepare, that sort of thing. I think all teachers go there at some point. But I got to thinking about the other side — what's it like to sit in a student's chair. >> Did you remember to prepare and bring what was requested? >> Did you get enough sleep and food to be ready to pick up some new skills? You see, I've been there too. I've forgotten to bring my stuff, I've come tired/hungry/upset/angry/late. It's a very frustrating position to be in as a student, and believe me, your teacher knows it. So part of what I do as a teacher is always bring things to make it better. Bandaids are good — real ones, and figurative ones. I do consider it my responsibility to help folks' wheels stop squeaking (oil, screw drivers, allen wrenches) or rig up a temporary drive band or brake band (hemp twine and elastic hair bands), and a whole second wheel just in case someone's totally implodes or, they forgot — but they made it to class, and that's a start. And for my spindle classes, I have collected the best of the best so that I can help students succeed. Learning to spin on a spindle someone gave you, or you found in an attic, is often frustrating. I know I don't give away my best spindles, and I see that in new students too — the spindle they were gifted I wouldn't give my meanest aunt. (I only have one aunt, and she's really cool, actually. Worth a Golding or three, if you ask me.) So my Turkish classes run on Jenkins Woodworking's Swans, my beginner top whorl classes run on my own Bellwether Spindle, and my Exotic spindling classes run on Bosworth featherweights and Forrester Akhas (sadly, no longer made). Do other spindles compare to those? Sure. 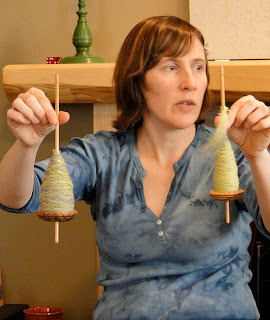 And I'm always happy to see a student with a good spindle, I encourage them to use it and even compare it to the ones I've brought so they can understand what they have is good. I'm especially thrilled to see a spindle I don't have yet ... my students help me find treasures at the same time as I show them my own spindle-loves. So before I head to a show, I get my sleep, eat my meals, and make my lists — to be a good teacher and a good student. Thanks for the reminder to look at my classes from the students eyes, especially when they are blurry. It's easy to think of small details that when you are planning a new class, easy to forget when you are in the classroom. I'm adding some "bandaids" to my class pack!